Over this past week I had the pleasure of reading a historical romance set in an era that I must admit I haven’t read willingly since High School. Don’t get me wrong, I have overdosed on different settings including Scottish historical period, the regency and Victorian eras, the desert sheik/island millionaire/business tycoon, the Native American, the Ottoman ruler, the expatriate, the Mountain Man, WWI, WWII, Korea, Vietnam and a few others I can’t list off the top of my head, but I can usually go back to them within six months. However, after being forced to read, re-read and analyze The Great Gatsby by F. Scott Fitzgerald to ad nauseum in school, I tended to avoid anything set in the ‘20s or ‘30s. 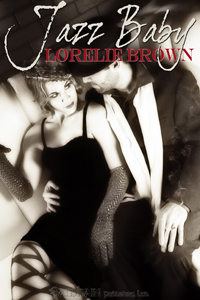 When Lorelie Brown, author of Jazz Baby releasing from Samhain Publishing on March 2nd as an ebook, asked if I was willing to read and review her book, I took a deep breath and said that I would. I wasn’t terribly worried because I had enjoyed the twitter, e-mail, and in one case: face to face conversation with Ms Brown. Per the FTC regulations, I must state that I received a copy of this book from the author for the purpose of reviewing it. The following excerpt is from the back cover blurb, which can be found at http://www.loreliebrown.com/. In the world of illegal speakeasies, Kate Kirkland has her life running smoother than a Model T. Maybe moving the family bar into the basement wasn’t the best choice for her alcoholic brother, but Kate’s making them a living—until a local gangster tries to expand his territory. Right into her bar. Luckily Micah Trent, her handsome and too-suave bootlegger, is ready and willing to offer her a helping hand. If Kate can bring herself to accept it. Since sharing one sensual dance to seal their deal, she can’t ignore the delectably wicked way he makes her feel. Micah is keeping secrets of his own. He’s a Prohibition Agent, sworn to shut down the gin mills and distilleries that keep illegal booze flowing. Kate’s speakeasy is next on his list—right after he uses her as bait to catch the gangster hunting her. I am glad I decided to end my self-imposed exile because Ms Brown certainly did not let me down. I was immediately drawn into the world of speakeasies, and undercover agents. Not the “Secret Agent Man” but something that seemed more realistic and gritty. I got a good feeling for both the corruption that existed in the upper echelons of law enforcement and the struggles/challenges faced by the speakeasy owners. I had never considered that they didn’t have to just worry about Prohibition Agents, but also the entire underworld and its power struggles. Ms Brown showed some of what lay underneath the glitz and glamour, not just on the business aspect, but also the personal by bringing her characters to life. I could feel Kate’s struggles and frustration with her brother, her intense attraction to Mica, and her determination not to lose her family business by mixing business with pleasure – or by meekly giving into the local gangster’s demands. I also felt Micah’s internal struggles between his job and loyalty to his partner, his equally fierce attraction to Kate, and his fear about what will happen when Kate finds out who he really is, and why he entered her life. I have to admit that I was concerned that Ms Brown would use some stale tropes as she worked her way through the various points of conflict in Jazz Baby. The first thing I was worried about was the hero’s sidekick revealing their true roles to the heroine in an attempt to “save his partner”. I was also dreading the possibility that the heroine would suddenly lose her backbone and independence then depend on hero to rescue her, her family and her business. While Micah does fulfil the role of a hero, Kate remains true to her character through the entire novel. Thankfully I predicted the solutions incorrectly. One of the few times I was glad to be wrong. I can’t tell you exactly how Ms Brown resolved my various points of concern without divulging major spoilers but I can say there is some very satisfactory groveling on Micah’s part *grin*. The supporting cast of characters provided more then just acting as foils to Kate and Micah’s character development. They each played integral roles in furthering Kate and Micah’s relationship or added to the layers of tension between the key players, including the primary villain – cue ominous music. One in particular that I wrote off as a gold-digging idiot managed to redeem herself from the idiot label. A complete 180-degree character shift would have jarred me from the world Ms Brown painstakingly created. That level of detail down to secondary and tertiary characters was just another reason I enjoyed reading Jazz Baby. I give Jazz Baby 4.5 out of 5 stars since Ms Brown left some string untied involving Micah’s partner and the young lady Kate rescued from living on the streets, no not the two of them together, but possibly with other characters. Maybe Ms Brown will provide a sequel. This sounds like an interesting read! I love this era, and don’t read about it often. I’ll have to look into this. @Has – hope you enjoy it. I know I certainly did. @Amanda – it was a very interesting read. Like I said it made me change my mind about that era. I read, I loved, I want more!! Thanks for the recommendation E! Wish we could have caught up with Ms. Brown at the Book Festival! @Silver I hope you were able to find it :). @MinnChica So glad you enjoyed it!